SYNOPSIS: Amid a coup, a North Korean agent escapes south with the country's injured leader in an attempt to keep him alive and prevent a Korean war. The world awaits to witness a historic moment as June 12, the date set for the summit between US President Donald Trump and North Korea supreme leader, Kim Jong Un draws nearer and nearer. Before the moment for World Peace arrives (if it happens), we recommend first to give Steel Rain, a North Korea theme espionage thriller a watch. What if the threats of nuclear nukes are real? What’s the effects on the diplomatic relation between South Korea and the States? In Steel Rain, a coup is rising in the North and an ex-agent, Um Cheol-woo (played by Jung Woo-sung) is deployed by his ex-boss to eliminate the people behind the coup. 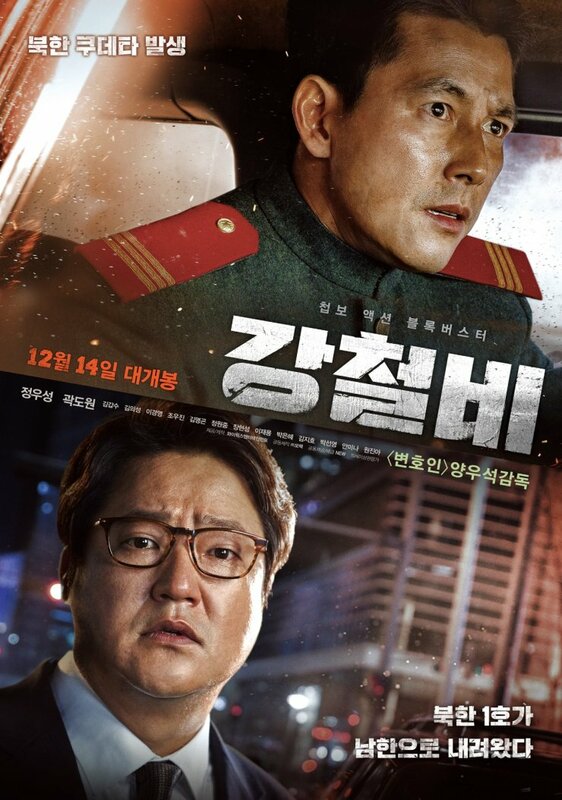 But instead of assassinating the targets, Cheol-woo finds himself rescuing their critically injured supreme leader (whose face is never shown throughout the entire movie) and transporting him to the South to seek treatment and also shelter him from North Korea agents who wants him dead. With no one to turn to, Cheol-woo decides to join hands with a South Korean foreign affairs senior officer, Kwak Cheol-woo (Kwak Do-won from The Wailing) to not only save the life of the North’s No.1 but the lives of millions living in the Korea peninsula as everyone prepares to out-nuke each other out of this planet. For those who are intrigued with all the almost daily political ongoing between the North and the South and their allies, Steel Rain is very much a godsend. Even with frequent scenes cutting to various political leaders, diplomats and their shouting matches, the entire movie never feels heavy-handed, pretentious or sloppiness for that matter. Director and writer Yang Woo-seok takes his ideas seriously at the same time, he also possessed the craft to churn out a bombastic action blockbuster so it’s not totally a boring affair. For those expecting something more thrilling, Steel Rain surprisingly has tonnes of it. From CGI-assisted missile explosions, car chases, messy gunfires to hard-hitting fistfights, Yang has everything in place. Despite the ominous tone, there are some tender funny moments between the two Cheol-woos as they talk about G-Dragon, capitalism and skinny noodles, a perfect showcase of chemistry from Jung Woo-sung and Kwak Do-won. Steel Rain is a smart espionage action thriller that never disappoints from the get go. The acting is superb. The action is executed with much flair and the story very relatable to the current state of political affairs in the region. The ending while predictable ends the movie on a sweet, somber note. Of course, in reality we want the summit to happen and ends on a very sweet note instead.